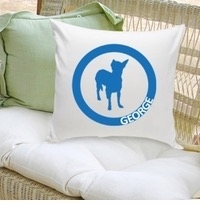 DETAILS: Our “Circle of Love” silhouette personalized throw pillow is a perfect gift for dog lovers. Customize the image for that extra personal touch! Our throw pillows come with a 16×16 cotton zip-off cover for easy washing. Machine wash cold to avoid shrinkage.